Pocket pets spend much of their time each day inside their cage which means they are completely dependent on their owners to provide them a clean, secure home to live in. Even though small animal responsibilities are not large, they are necessary to tend to in order for your pet to be comfortable. Food dishes get fouled quickly by inquisitive pets who love to climb inside their dishes and play around with their food. You’ll need to wash food dishes every few days to give your pet a clean eating area. Little bits and pieces of food still get inside the water bottle and float around, contaminating it with bacteria, so keep an eye on the contents and clean as frequently as needed. Changing the water daily and cleaning the bottle every other day with hot water and a bottle brush or cotton swabs is a good maintenance plan for your pets. Generally, soap is not needed as it can leave unpleasant residue on the bottle your sensitive pet tastes. Hot water sterilizes and does the trick. Check your pet’s nails regularly for growth, nails that are too long can snag on things and making walking uncomfortable. If they look too long, you can clip or file them. 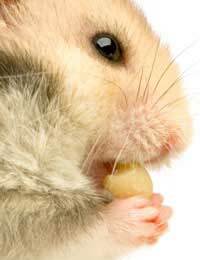 While most pocket pets are self groomers and don’t need much in the way of bathing, you can supply a bathing salt or powder (often made of ground pumice) for gerbils, hamsters and mice to roll in, which helps clean off accumulated oils and dirt in the fur. If you are going to allow your pocket pet access to roam around your home, you’ll need to gnaw proof all the wires, cords and other chewables, plus escape proofing all cracks, holes and vents in the room before letting your pet free. Pay special attention to wires and such with rabbits, guinea pigs and rats, you can safety proof these by covering with a thick plastic, flexible metal or PVC tubing. Hamsters, gerbils, rats and mice are adept at squeezing through small spaces and into the insides of furniture, so take a good look around the rooms your pet will have the free run in and stop up all access points and escape routes. Providing toys, exercise and playtime with pets is what keeps small animals from being bored within the confines of their cages. Try to imagine what you’d feel like being shut in a room all day and night long! Kids should be encouraged to play with their pets every day and use their imagination and ingenuity to make their pet’s environment as lively, varied and interesting as possible. The more exercise a pocket pet gets, the healthier and happier a life they are leading. The toys and gear in your pet’s cage also needs to be cleaned regularly. The bedding in the bottom of your pet’s cage doubles as both flooring and a toilet area. If possible, toilet train your pet to use a litter box to save you from having to change the entire bedding as frequently. Most pocket pets are litter trained fairly easily by placing waste material into the litter box to give pets the idea, though many will still continue to occasionally use the bedding as a toilet as well. Litter boxes should be emptied every day or two and bedding should be changed weekly, more frequently if there are numerous residents or the cage is getting smelly. Leaving a little bit of the old bedding mixed in with the new reassures pets because it retains their scent so try and do this if you can. Remember, pets in cages have no escape from their own messes so taking care of cleaning responsibilities makes a big difference in their health and quality of life.